Are you interested in early scuba or helmet diving equipment, World War 2 frogmen, marine salvage or any other aspect of our Australian diving heritage? The HDS Australia – Pacific is the ideal place to learn and share your interest through our quarterly magazine, Classic Diver and by networking with members at film nights, historical tours, collectors groups, annual rallies and the international historical diving community generally. 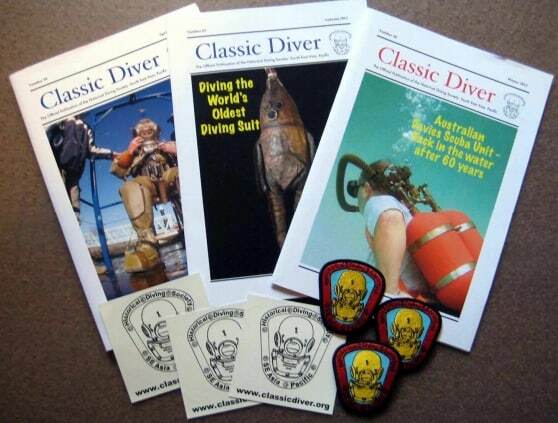 Your annual HDS Australia Pacific membership subscription will include postage of four issues of our quarterly ‘Classic Diver’ magazine per year, mailed out at the start of each season and our ‘Starter Pack’ including bumper stickers and cloth badges. To receive a Membership Application Form and payment details, please contact our Membership secretary, Des Williams by emailing to deswill@dingley.net. Please title your email “HDS Membership Application” for a prompt reply.